Natalie and Naomi watch as Invisible Fence owner Beth Ericson and firefighter Dustin Trout demonstrate how pet oxygen masks are used. 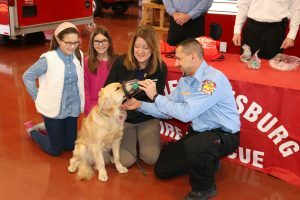 On Wednesday, February 7, The Pittsburg Fire Department received a special delivery of pet oxygen masks to help animals on the scene of house fires and other emergencies. The masks are designed to deliver life-saving oxygen to pets exposed to smoke or other airborne toxins. The donation was made possible with the help of 11-year-old Natalie Brueggemann and her sister nine-year-old Naomi Brueggemann, who encouraged the fire department to order the masks. Their idea was sparked last year when the girls attended fire prevention week in Pittsburg. As they learned how first responders rescue people, they wondered: do firefighters rescue dogs and cats too? While firefighters prioritize human life first, they also help rescue animals, if they know pets are in the home. To help protect their four-legged family members, the kids decided to place warning stickers on the front and back doors of their house, to notify first responders that pets are inside their home. But, their work didn’t stop there. Natalie and Naomi Brueggemann pose with Invisible Fence mascot, Gin. The girls came across a video on Facebook demonstrating how fire departments use pet oxygen masks to treat animals on the scene of a fire. Not knowing the answer, their parents, Josh and Sammie, helped the girls compose an email to Pittsburg Fire Chief Mike Simons, and they asked if the fire department had oxygen masks for animals. The fire stations in Pittsburg didn’t have pet oxygen masks, but Chief Simons and Fire Marshal Tom Vacca liked the idea and recognized the potential benefits of having them on hand. With the fire department on board, the Brueggemanns began brainstorming ideas for how to get the masks donated to the fire department. The project seemed challenging at first, but the girls were determined to make it happen. Fortunately, the process was easier than they originally thought. After some research, they discovered Project Breathe, a program through Invisible Fence that distributes free pet oxygen mask kits to fire stations across the country. Each kit is equipped with three sizes of oxygen masks for small, medium and large pets. The masks help treat pets exposed to airborne hazards, such as smoke, natural gas and carbon monoxide. With the Brueggemanns’ help, the fire department was able to acquire enough pet oxygen mask kits for all three fire stations in Pittsburg. Fire Marshal Tom Vacca says the Brueggemanns were the driving force behind the project and he’s impressed with their enthusiasm for helping the city. The girls’ mother Sammie Brueggemann says community service is important to their family, and she is proud of her daughters for their hard work and determination. “I want my kids to learn that it only takes a small effort to make a big difference,” she said. In addition to their love of animals, Sammie says her family also has a special appreciation for firefighters. 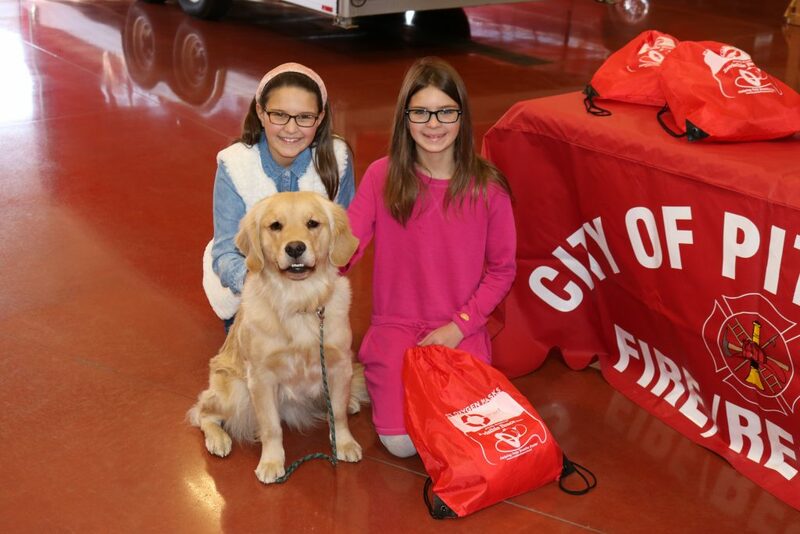 Now that all three Pittsburg fire stations have pet oxygen masks, the girls are determined to take the project to the next level, and equip other fire stations in the area with pet oxygen masks. The Pittsburg Fire Department is working with the Brueggemann family to connect other fire departments to the program, and help save pets throughout the four state area. Pet oxygen masks are only for pets on the scene of structure fires or other emergencies in which firefighters are dispatched. If a dog or cat is experiencing a medical emergency, please contact your veterinarian.